Professor Josh Slater receiving the Sir Colin Spedding Award on behalf of Jim Green, presented by HRH The Princess Royal, President of the National Equine Forum last week. A pioneer of equine emergency rescue has been honored with a prestigious award in Britain. Jim Green was announced as the winner of the Sir Colin Spedding Award at last week’s National Equine Forum (NEF). The special commendation was given in recognition of Green’s outstanding work to improve equine rescue skills in the UK. He was selected from a shortlist of three nominated candidates, the other two being side-saddle authority Maureen James and equine veterinary nurse Bonny Millar. 2017 Sir Colin Spedding Award winner Jim Green. Professor Josh Slater was presented with the Award on Green’s behalf as he is on sabbatical in the USA. Slater is a co-director (with Green) of the British Animal Rescue and Trauma Care Association (BARTA) and has been a veterinary lead in the equine rescue initiative in the UK from the start. Green grew up in the New Forest and trained as a Forest Manager before joining Hampshire Fire and Rescue Service in 1996. 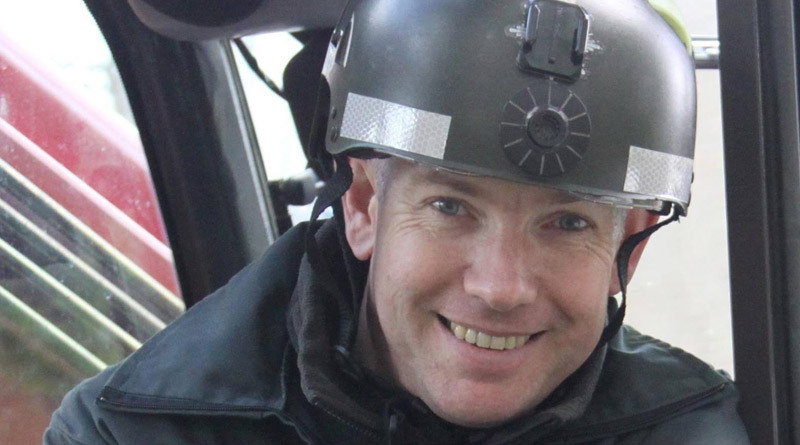 Since 2004 he has been at the forefront of response to animal rescues in Hampshire and led the implementation of animal rescue methodology, training and equipment that is now standard throughout the UK Fire and Rescue Service. Green and Slater helped to set up Safer Horse Rescues, an equine rescue initiative, launched by the British Equine Veterinary Association (BEVA) and the UK equine industry in 2007, in close partnership with the animal rescue specialists at Hampshire Fire and Rescue Service. Green has been keynote speaker at conferences in the UK, USA, Turkey and Australia, and was rescue advisor to the Veterinary Services Team at the London 2012 Olympic Games. He continues to manage the British Animal Rescue and Trauma Care Association in a voluntary capacity. Green is currently in the United States for 12 months, developing animal rescue and disaster response capabilities, working for the Centre for Equine Health at the University of California. Horse rescue training in Hampshire, with the British Animal Rescue and Trauma Care Association. Green will deliver the Memorial lecture at the National Equine Forum 2018. The Sir Colin Spedding Award was established in 2013. The bronze sculpture of a stag beetle by Belinda Sillars was originally to have been awarded to the late Professor Sir Colin Spedding, in recognition of his services to the equine sector – most especially for his extraordinary commitment in founding the National Equine Forum and then being Chair of the Forum for 19 years. Previous recipients of the award are: Sue Martin BHSII who runs Trent Park Equestrian Centre (2016), Paul Greeves former Executive Director and Keeper of the General Stud Book at Weatherbys (2015), Dr Andrew Waller on behalf of the Animal Health Trust (AHT) Infectious Diseases Group (2014) and Martin Clunes on behalf of UK Equine Welfare Charities (2013).